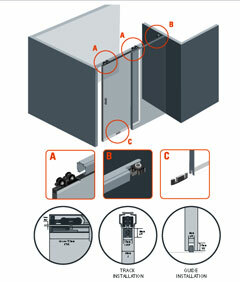 Top sliding system for doors installed inlay the opening and traveling inline. Installation of 2 tracks U45 in parallel allows for 2 doors traveling in bypass. One box with all you need to install 1 door, just order the track and you are ready to go. 110 lbs max weight per door. Stoppers with retention device installed inside the track will stop and retain the door in position. U 45 aluminum track for a silent glide. Fascia for U 45 track (accessory) will easily install with a snap providing an elegant finishing. Carrier is installed laterally making the installation an easy process.